An Unusual Trip: Virginia’s Treehouses, Lighthouses and Other Unexpected Travel Destinations | Cover Story | Style Weekly - Richmond, VA local news, arts, and events. 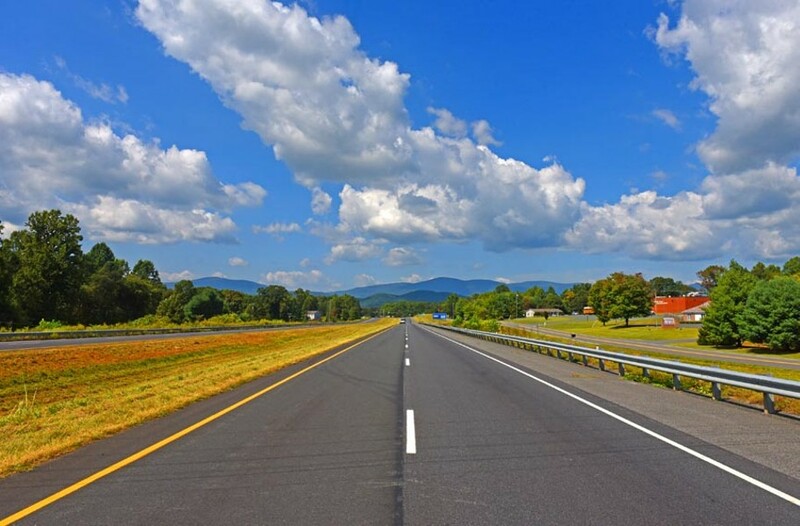 Scott Elmquist Just 90 miles northwest of Richmond, rural countryside is surrounded by mountain views in this westward view of Route 33 in Greene County near Stanardsville, a small town with few people but lots of character. After twisting and turning through a wooded area of rural Stanardsville, population 384, my cousins and I finally arrive at our destination when we spot a flashing open sign attached to a gazebo that leads to a tall treehouse. Using cell phones as flashlights, we walk toward signs welcoming us to the Castle, while more wooden signs direct us to a sauna and the cryptically named Zen Barn. A statue of Buddha sits alone in the long grass, while a nearly 40-foot-tall red tower looms above us looking down on this unusual universe just 85 miles from Richmond. 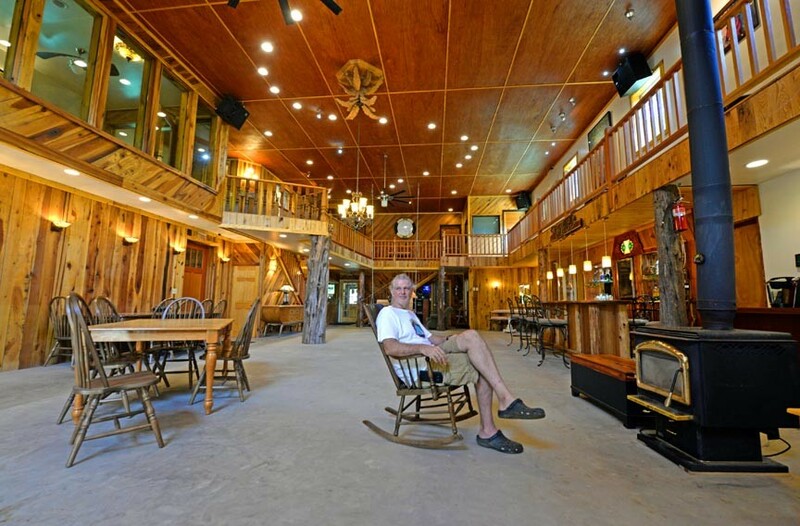 David VanDerveer, the owner of vacation properties at the White Lotus Eco Spa Retreat, sits inside a communal building for his guests dubbed the Zen Barn. This otherworldly place, dubbed the White Lotus Eco Spa Retreat by its owner, is one of more unusual places in Virginia that Richmonders looking for a change from the day-to-day can visit for weekend voyages that fire up the imagination. The appeal: These are places that break the standard expectations of travel destinations. Among some of the more unconventional destinations in Virginia, you’ll find tiny houses, boathouses, lighthouses, log cabins and even camping-esque resorts for those resistant to particularly rugged travel. VanDerveer chats with customers outside the Zen Barn. VanDerveer is a longtime professional juggler and comedian, who has spent 35 years building the retreat in Stanardsville. “This is obviously unique, and there aren’t many places quite like this,” says David VanDerveer, 54, the owner of the resort. “There are all these little magical spots on the property.” He’s an easy-going conversationalist who can be seen roaming the property, talking and laughing with guests, just about any hour. As it turns out, the cozy treehouse, gazebo and surprising three-suite complex, the Castle, that I saw when we pulled up is just a portion of a wildly unusual resort that sits on 21 acres. VanDerveer owns 12 units nestled between wineries in the hilly terrain in Greene County about 20 miles north of Charlottesville and 20 miles east of Shenandoah National Park. In addition to suites, the rest of the complex is open to all guests, with a living space and large kitchen. Here, much like other parts of White Lotus Eco Spa Retreat, the normal rules don’t apply. Banisters are made of logs, but you’ll find a gorgeous $13,000 dining table in the kitchen. VanDerveer says he scored $140,000 worth of furniture for $8,000, so he rolled with it and makes it work engagingly. Many of the structures at White Lotus Eco Spa Retreat are supported by trees that are used as pillars. 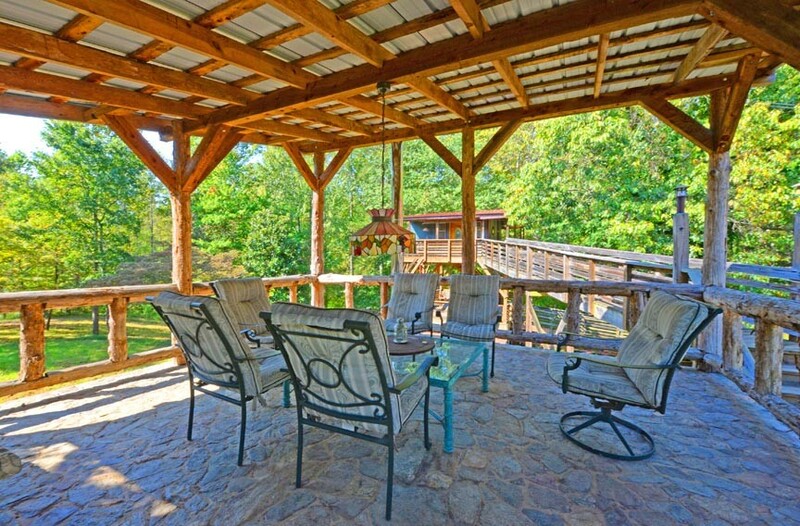 The Treehouse and Skywalk at White Lotus is one of several treehouses available for vacation rental in mountainous areas of Virginia. The upper level of the complex overlooks a furnished living room below — not entirely devoid of occasional spider webs. It’s in that lower level that VanDerveer, once a professional entertainer who juggled a chain saw, egg and torch, says that he practiced his act long before he turned the place into a rental property. He’s gradually constructed the 7,000-square-foot complex mostly by himself over the course of 35 years since purchasing 5 acres shortly after graduating from high school. VanDerveer, a self-described class clown, and a friend also installed the wallboard in the living area while riding 6-foot unicycles. Elsewhere on the property, there are saunas and even a dipping pool filled with river water. VanDerveer says he swims in that dipping pool, but, he acknowledges, frogs could be a part of the wildlife not visible in the murky water. A short walk away, I find a massive, two-story building known as the Zen Barn, with high ceilings and seemingly random but valuable displays. There’s an old-fashioned poker table in one room, as well as a massage table in another — massage therapists are available for a fee with reservations — and then there’s a movie theater. I also see a swing that hangs from the ceiling inside the Zen Barn, which would make more sense outdoors if it were anywhere else in the world, but here, it fits perfectly, precisely because it’s so awesomely weird. A gazebo leads to a treehouse at the White Lotus Eco Spa Retreat, where vacation homes are tucked away in the woods but just miles from the scenic views of the Skyline Drive. “A lot of people get freaked out,” VanDerveer says of the dim lighting, background music that plays just about all the time and vast wide-open spaces in the place. “It’s like a scene for a horror movie or something.” He says that the strangeness isn’t for everyone, but it’s adored by many, attracting visitors from all over the country. And the property feels like a journey inside VanDerveer’s mind with its imperfections and the various unfinished projects throughout. For a less jarring experience, though, I discover guests can make their way through the woods to enjoy a game of disc golf. As far as burdensome regulations for his guests, VanDerveer doesn’t believe in them. “I’d want to just go somewhere and do what I want to do and have fun,” he says. “I hate anybody telling somebody what they can or can’t do as long as they’re not bothering someone else.” And don’t be surprised to spot VanDerveer at the sauna at any hour of the day either. He says that he gets his energy from talking with people, but needs to meditate there when he’s alone. 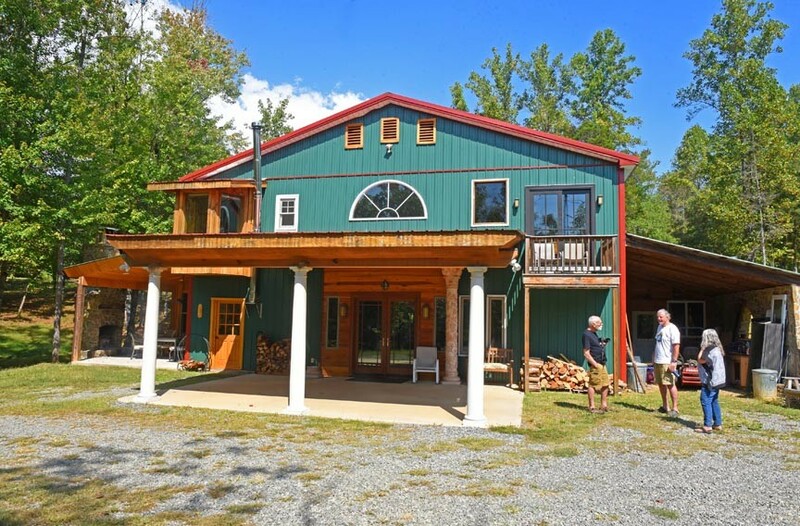 Just a few miles away — still near Stanardsville — VanDerveer also rents a tiny house, as well as a log cabin on a stream, among other properties in the area. 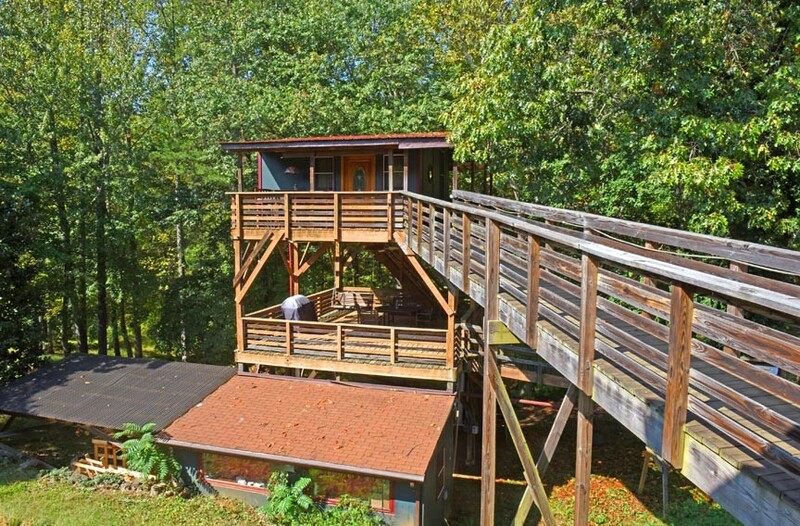 His treehouse is one of several in Virginia available on Airbnb. 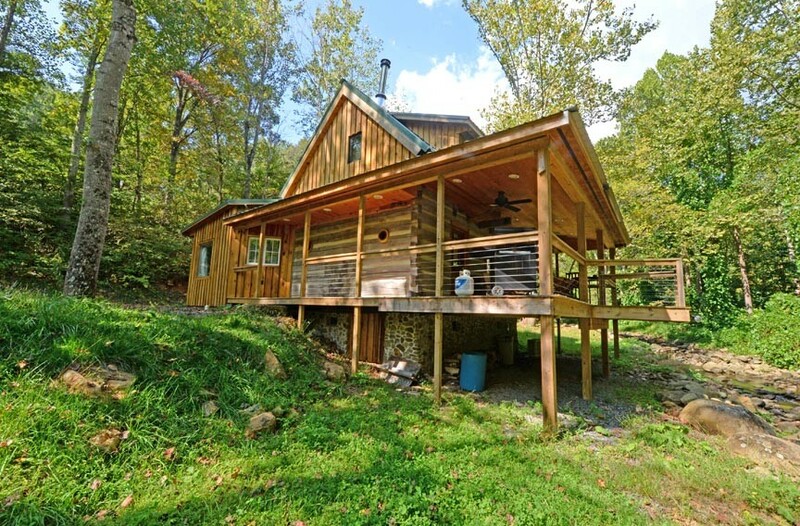 The log cabin on the river sits just feet from Swift Run Creek and less than 10 minutes from the Shenandoah National Park, surrounded by woods. The man is a proponent of peacefulness, nature and fun — even if it’s unorthodox. Later this year, VanDerveer will hold a medieval feast on his property, he says, and those attending will need to dress accordingly. VanDerveer himself plans to dress and perform as a juggling jester for a medieval king. My room used to be called Suite P, but VanDerveer figured it would be catchy to rename it “Sweet Pea.” So, he has, sort of, though the signs don’t necessarily indicate that. But again, with his ideas flowing quickly and overlapping one another, it’s the sort of thing that’s likely to be implemented in due time — perhaps in bits and pieces. It’s all part of the experience when you visit White Lotus Eco Spa Retreat — you discover strange, unusual ideas, as well as those still underway, in a project that is endlessly a work in progress. The nightly cost of rooms at White Lotus Spa Retreat start at $125, and information can be found on the Airbnb website. Smithfield Station is perched above the Pagan River and features a replica of a Chesapeake Bay-style lighthouse, where two suites are available for rent. 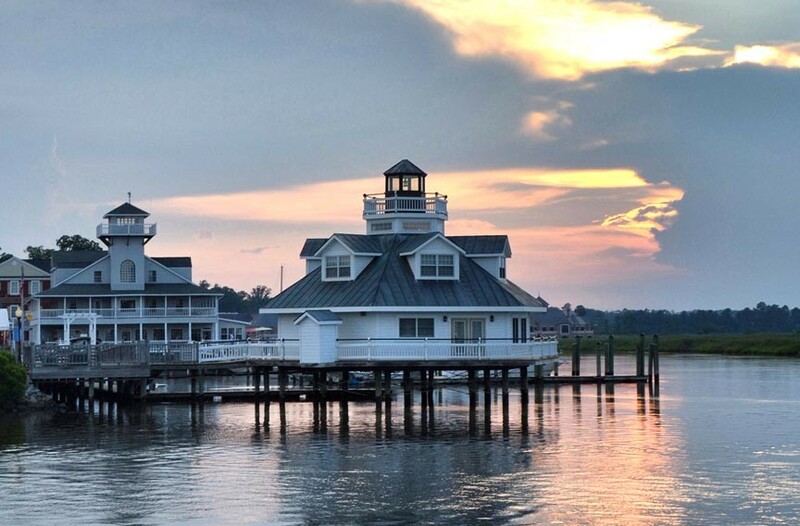 For those fond of grand water views, Smithfield Station (smithfieldstation.com), about 70 miles from Richmond, says it has Virginia’s only lighthouse accommodations. Built in 1994, it’s a replica of a working Chesapeake Bay-style lighthouse. Inside you’ll find two spacious suites that command views on all sides perched above the Pagan River. They’re booked, says Randy Pack, the co-owner of Smithfield Station, about six months in advance. The two suites, named Captain Todd and Captain Sinclair — typically cost between $300 and $350 per night. While there isn’t a massive beam of light sweeping over the community as some might expect, it is indeed a working lighthouse with a light on top. “It’s just a really neat place to stay and great views of the river,” Pack says. Elsewhere in the state, those looking for a getaway in the woods without being seasoned campers can visit Camp Karma at Smith Mountain Lake. It’s one of the many glamping sites in Virginia, which are loosely described as less rugged, primitive versions of camping. Although glamping accommodations can be elaborate, Camp Karma is more down to earth. Here, for $85 per night, as many as four campers can stay in a roomy 10-person tent. It’s already set up for you, and it provides all the camping necessities — and niceties — including dishes, utensils, camp chairs, wood, ice, cots and mattresses. Campers need only bring blankets and pillows. You can also find log cabins, hotels purporting to be haunted and boathouses for rent in Virginia. VanDeveer contends that Airbnb, a website that connects guests with noncorporate renters, has opened the doors for new exploration opportunities.